Dental-001 Colorful background with dental instruments. 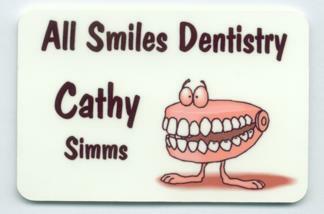 Great for dentist offices. This image can be produced with plain backgrounds also, just note what color background you would like in the item comment area. Use bold fonts with contrasting medium/thick outline for best results on photos or busy background images. 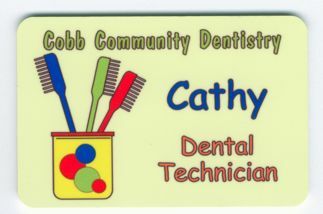 Dental-002 This colorful graphic is great for dental offices, etc. For best results on photos or busy background images, use bold fonts with contrasting medium/thick outline. The sample shown is on our 1.25" x 3" badge size with a Kabel font (you can ask for this in the comments area if you like) in deep navy blue with a deep yellow outline. Dental-003 This colorful graphic is great for dental offices, etc. Dental-004 Photo image of a toothbrush and toothpaste. As shown in this image, if you like, you can request (in the comment area on your badge order) line 1 to be positioned vertically on the left side of the badge with lines 2, 3 and 4 on the right side. Dental-005 Graphic image of a child smiling with a toothbrush and toothpaste in hand. This image can have a different color background which you can request in the "comments" area of your badge order. 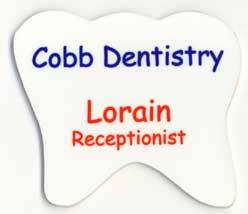 The sample shown is on our 1.25" x 3" badge size with a Comic Sans font in black. Dental-006 Dental Assistant logo. This badge can have a different color background which you can request in the "comments" area of your badge order. Fish-002 Cartoon graphic image of a fish showing off his teeth. Great image for pet shops, dental offices, aquariums, day care centers, etc. If you would like a different background color, please note that in the "comments" area of your badge order.